NEW series: Meet the team! First up, Tim Gehring. First up:Tim Gehring, Policy and Research Manager. Q: Describe your job in a nutshell. A: I represent IJM policy goals with Congressional offices and staffers and with the executive branch and administration, State Department, USAID, and other relevant U.S. government agencies. Q: What does a typical week look like for you? What type of things are you doing? A: Responding to meeting requests with Congressional staffers, planning our strategic outreach on policy with Holly Burkhalter, and monitoring current events and their implications for IJM’s goals. A: Explaining IJM’s work to Congressional offices and trying to figure out potential ways for them to support IJM’s casework. For example, we recently worked on a campaign to help keep kids in Guatemala safe from child sexual assault. There is this great synergy between IJM's field office in Guatemala, our Latin American team in HQ, and what Holly and I and our advocates were doing. It was great because we were all supporting what each other was doing and it was really one of the first times that the U.S. government has funded law enforcement to protect children from sexual crimes. A: Iceland! I want to go on a biking, camping, trekking trip through Iceland. A: My father. He’s the best example of faithfulness that I know. Q: Best book you’ve read recently? A: I’m reading East of Eden now, and I really love it. Also Endurance, it’s about Shackleton’s legendary Antarctic expedition. Q: One thing you’ve learned from your work at IJM? A: That the way you go about doing your work is as important as the work that you do. 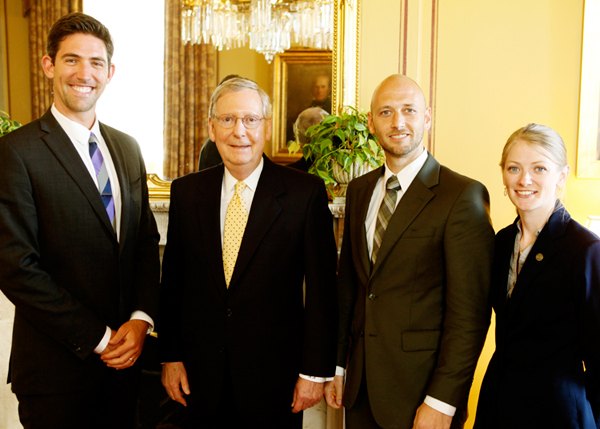 Advocates meet with Senate Minority Leader Mitch McConnell (KY) at the 2014 Advocacy Summit. Meet Melanie Beilfuss - Melanie is sadly no longer with IJM, but Government Relations & Advocacy Vice President, Holly Burkhalter, has a new Executive Assistant. Her name is Opa Owiye; look out for more about her soon.